What is a performers’ role when co-creating with a director? How is this responsibilty shared in regard to the process? Our bodies, containers that transpose voice in motion? How can performers direct from within? I believe that contemporary dance processes have much to gain from an intense stimulated dialogue between the outside eye – the director and the inner eye – the performer/dancer. The sense of eye in both cases is spatial, the one who finds himself in the improvisational space generating material and the one observing catching and directing the material. It is in the richness of this relational dialogue that the process culminates to unfamiliar ground thus affecting the work presented. Supporting the performer to attain strategies, distinguishing within the constant change that can however be molded into mechanisms of dialogue with the work, allowing the dancer to gain an autonomy in their (re)search and process of material is what the workshop “Strategies Regarding the Contemporary Performer” proposes. 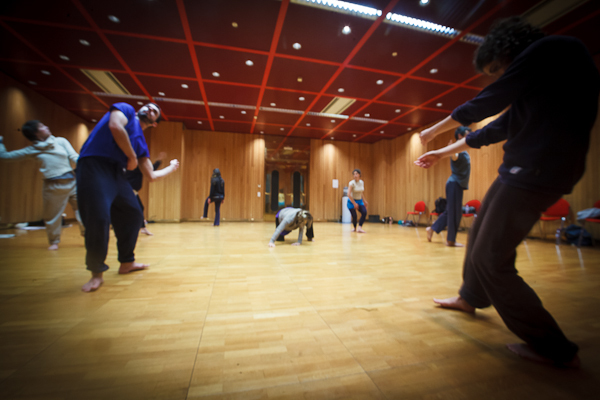 A workshop based on assisting dancers/creators in process and who feel the necessity to open up their work – to encounter it differently, Also directed to those with a desire to alter own movement/compositional patterns. A proposal of working that confronts therefore it is utterly important clarity in attending such a work. A focused one to one direction occurs, in the presence of the other attendents, as well as a daily individual bearing, even though in group, practice. Having concentrated my work and research directed at improvisation into composition and adjoined the experience and process of work making in galleries, from which notions of presence emerged. After experiencing how differently a body performing on stage can be constructed as opposed to an installed present body in a gallery, led me to pursue such inquiries of physical motion and space. Both processes have given a wide range of possibilities to venture into process. While deal with decisions, accidents, experiments, being aware of their potential or loss of energy, led the work towards its solidification. Consciously knowing what one chooses to keep as material informs us on the work taking shape, just as knowing what not to keep informs us.